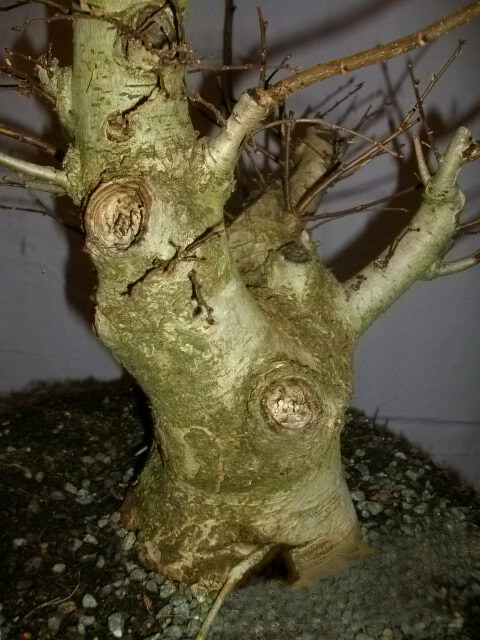 Bonsai enthusiast Samuel Brierley, the owner of this 40cm/16" tall Siberian Elm/Ulmus pumila, asked me recently if I would suggest a design for the tree and sent me a number of images from which I could design him a bonsai. Sam lives in New Zealand and the tree had just entered dormancy, dropping its leaves and revealing its branch structure; a perfect time for styling deciduous bonsai. While the tree had an impressive trunk taper and size and was in good health, it also had many aesthetic defects that would need to be addressed before its full potential as a bonsai could be realized. After studying images of the Elm, I found my favourite front for the tree (above). As the basis for all good bonsai design, the trunk and trunkline must first be established as, unlike the branch structure and exact placement of the branches themselves, the appearance of the trunk is the most difficult part of a bonsai to change. However, from my proposed view, it was easy to see that the large crossing root was ugly, there were a number of large perfectly circular wounds that were obviously man-made and the top half of the trunk lacked taper, coming to an abrupt halt where the tree had been chopped in the past. The large crossing root at the front of the tree, not only is this root out of scale and growing sideways, it is also very straight and untapered. In this particular case, the best solution would be to remove the root entirely. (Virtual image) With the root growing sideways along the trunkbase, the resulting wound would be surprisingly small and when hollowed out into an uro (literally a deadwood hollow) it would become much more attractive. As Elm (along with most deciduous trees) do not have strict life-lines there was no risk of losing any top-growth as a result of removing the root. 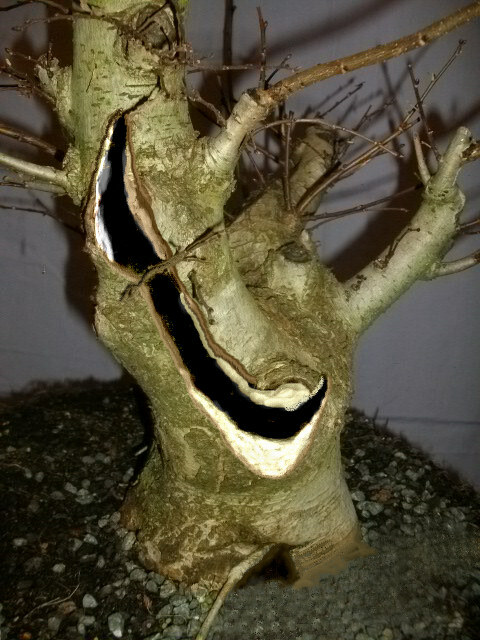 (Virtual Image) The next problem to resolve on the trunk were the large wounds where branches had been removed in the past. Two large wounds could be seen on the front of the tree and their perfectly rounded appearance belied their manmade origin. Wounds such as these can sometimes be made to look more natural and aesthetically pleasing by simply altering their shape and hollowing them out into Uro. However, I felt that combined with the new hollow at the base, the three proposed uro would look slightly strange and isolated. And so the idea of linking the wounds into a long shari began to take shape. The shari could then be hollowed out deeply, adding a great deal of interest to the trunk and the bonsai as a whole. 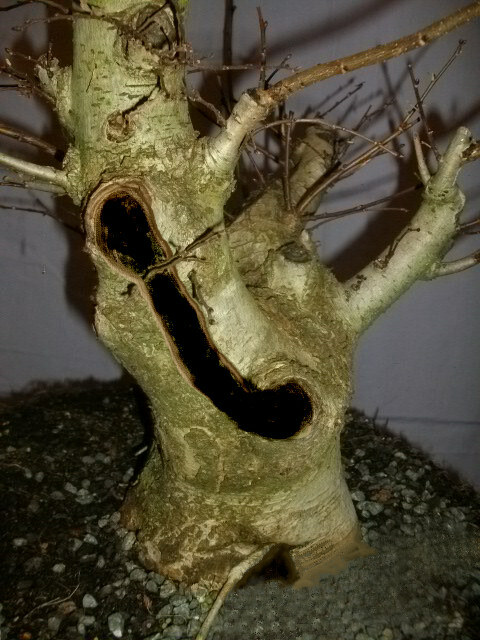 Designing a deciduous bonsai deadwood feature (such as a large shari) can be difficult. The temptation can often be to randomly carve out a section of the trunk, the result being that the shari does not seem to 'work' with the rest of the tree. 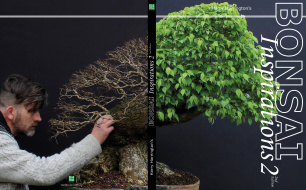 It is much better that an element of design is introduced into the all-important outline of the deadwood feature and this is best accomplished by imitating existing lines on the bonsai itself. As indicated in the diagram above, the area between the two wounds was bordered by the strongly curved edges of the trunk. By replicating these curved edges, the shari could be designed so that it reinforced the natural lines and movement of the trunk. (Virtual Image) And so I drew a shari/large hollow connecting the two large wounds that followed the flow and movement of the trunk. By connecting the wounds, their roundness was removed and they began to look more natural. However, the shari could still be further improved. (Virtual Image) To further remove all traces of the wounds, I then virtually extended the shari out at each end.